This will be quite an active period in the eastern US as a strong surface low passes to the northwest of the I-95 corridor with lots of strong energy aloft to support this system. The trailing cold front from the low pressure center will be the focus of the heavy rain and the severe weather threat from later tomorrow into early Monday. The combination of deep moisture (dew points will become much higher on Sunday), an impressive jet streak in the upper atmosphere, and the sharp temperature gradient at the lower-levels of the atmosphere will result in a severe weather threat as the cold front treks eastward towards the I-95 corridor and this threat may actually reach its peak here in the wee hours of Monday morning. The severe weather threat includes potentially damaging wind gusts of up to 60 mph, hail and even isolated tornadoes. 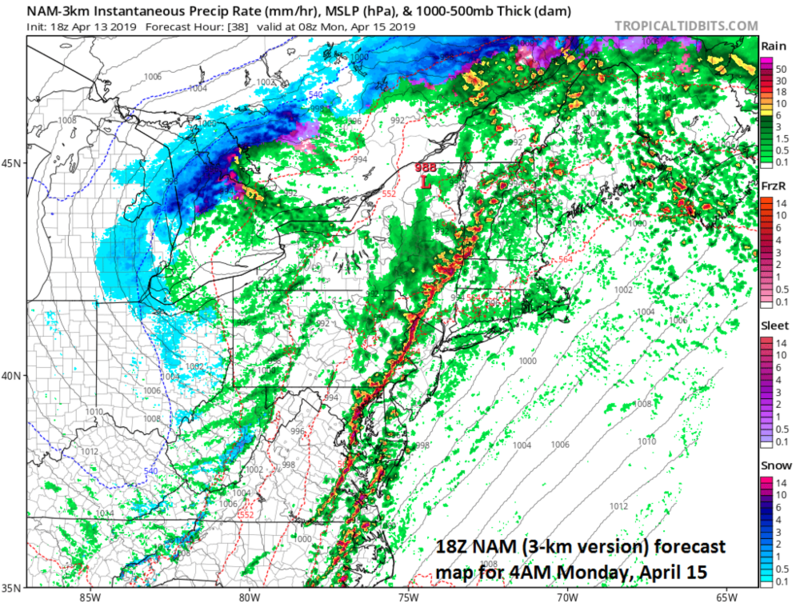 The latest high-resolution forecast model (NAM 3-km) suggests a N-S oriented line of strong-to-severe thunderstorms could cross the DC-to-Philly-to-NYC corridor around 3 or 4 am on Monday and this could also result in a localized flooding threat as grounds are well saturated and downpours will likely accompany the frontal band.